Submitted photos These four individuals from one family have been arrested in the murders of eight people in Pike County. 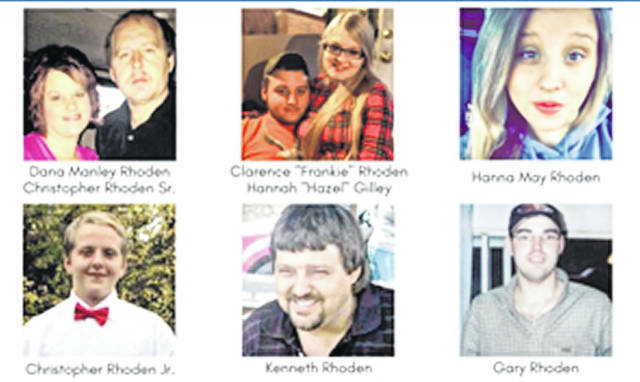 Victims in the Pike County murders. WAVERLY — Ohio Attorney General Mike DeWine, Pike County Sheriff Charles Reader, and Pike County Prosecutor Rob Junk announced today that a husband, wife, and their two adult sons have been arrested for the murders of eight people in rural Pike County. George “Billy” Wagner III, 47, Angela Wagner, 48, George Wagner IV, 27, and Edward “Jake” Wagner, 26, of South Webster, are each charged with eight counts of aggravated murder with death penalty specifications. The eight counts represent each victim found dead on April 22, 2016. The Wagners are accused of killing seven members of the Rhoden family, plus the fiancée of one of the Rhoden victims, at four different Pike County homes. Killed were: Christopher Rhoden Sr., 40, his ex-wife Dana Manley Rhoden, 37, and their three children, Hanna May Rhoden, 19, Christopher Rhoden Jr., 16, and Clarence “Frankie” Rhoden, 20. Frankie Rhoden’s fiancée, Hannah “Hazel” Gilley, 20, was also killed, along with the elder Christopher Rhoden’s brother Kenneth Rhoden, 44, and cousin Gary Rhoden, 38. Most of the victims were killed as they slept. Three young children at home at the time of the murders were left physically unharmed. Authorities arrested the suspects this afternoon, without incident. They were indicted this week by members of a Pike County grand jury who have been examining evidence in the case since July. The indictments were filed less than a week after authorities confirmed the existence of a homemade firearm suppressor believed to have been built by the suspects. The Wagners are also facing a series of additional charges including conspiracy, engaging in a pattern of corrupt activity, tampering with evidence, unlawful possession of a dangerous ordinance, forgery, unauthorized use of property, interception of wire, oral, or electronic communications, obstructing justice, and aggravated burglary. The indictments allege that the suspects purchased ammunition, a magazine clip, brass catcher(s), and a bug detector in preparation for the crimes. They also allegedly obtained and shared information about the physical layouts of the victims’ properties, their habits and routines, sleeping locations, and countersurveillance devices present on their properties, including pets. The indictments accuse the Wagners of tampering with phones, cameras, a silencer, shell casings, and parts of a home security system. Jake Wagner is also charged with unlawful sexual conduct with a minor for having sexual contact with Hanna May Rhoden when she was 15 years old and he was 20 years old. Jake Wagner is the father of Hanna May Rhoden’s older daughter, who was staying with the Wagners on the night the homicides took place. All four suspects are accused of forging custody documents. A copy of the indictments filed against Billy, Angela, George, and Jake Wagner can be found here. Also arrested today were Angela Wagner’s mother, Rita Newcomb, and Billy Wagner’s mother, Fredericka Wagner. Both Rita Newcomb, 65, of South Webster, and Fredericka Wagner, 76, of Lucasville, are facing felony charges of obstructing justice and perjury for allegedly misleading investigators over the course of the investigation. Newcomb is also charged with forgery. Their indictments can be found here. The six arrests are the result of a joint investigation led by the Ohio Attorney General’s Bureau of Criminal Investigation (BCI) and the Pike County Sheriff’s Office. The cases will be prosecuted by the Pike County Prosecutor’s Office and the Ohio Attorney General’s Special Prosecutions Section acting as special assistant prosecutors. Throughout the investigation, authorities estimate that they conducted tens of thousands of hours of investigative work; followed more than 1,100 tips from the public; conducted 550 interviews; tested more than 700 items of evidence; and served more than 200 subpoenas, search warrants, and court orders. Several dozen state, local and federal agencies assisted in the investigation. Nearly two dozen law enforcement agencies from 10 different states and Canada also assisted with the investigation. Anyone with additional information related to the murders should call BCI at 855-BCI-OHIO (224-6446) or the Pike County Sheriff’s Office at 740-947-2111. An indictment is merely an allegation and is not evidence of guilt. The defendants are presumed innocent until proven guilty beyond a reasonable doubt in a court of law. https://www.xeniagazette.com/wp-content/uploads/sites/32/2018/11/web1_arrested.jpgSubmitted photos These four individuals from one family have been arrested in the murders of eight people in Pike County. https://www.xeniagazette.com/wp-content/uploads/sites/32/2018/11/web1_victims.jpgVictims in the Pike County murders.